Providing a hurricane evacuation route to Interstate 95, Pineda Causeway is a four-lane expressway crossing the Indian and Banana Rivers in Brevard County. Photo taken 09/28/13. Florida 404 follows 4.139 miles of Pineda Causeway, a limited access expressway spanning Indian River Lagoon and the Banana River between the town of Palm Shores and Patrick Air Force Base. The state road connects with U.S. 1 and Pineda Causeway extension at the west end and Florida A1A at South Patrick Shores on the barrier island. Pineda Causeway west from U.S. 1 to Interstate 95 is a locally maintained arterial. The 0.451 segment between Wickham Road (CR 509) and the west side ramps with U.S. 1 is designated County Road 404. Pineda Plaza Way, the former alignment west 0.195 miles to CR 509, is also an unsigned branch of CR 404. Trailblazers for SR 404 and U.S. 1 stand along the Pineda Causeway extension between Interstate 95 and County Road 509 (Wickam Road). This portion of the four-lane arterial is maintained by Brevard County and otherwise unnumbered. Photo taken 09/28/13. Pineda Causeway passes between the Grand Haven and Brisbane Isle subdivisions east from Interstate 95. A groundbreaking ceremony for Pineda Causeway Extension between I-95 and Wickham Road took place on April 7, 2009. This project cost around $7.2 million.3 Photo taken 09/28/13. St. Andrews Boulevard south and Estuary Boulevard north come together from adjacent subdivisions at the first signal east of I-95 along Pineda Causeway. Photo taken 09/28/13. Pineda Causeway curves northeast between the St. Andrews Manor and Grand Haven neighborhoods beyond Estuary Boulevard. Photo taken 09/28/13. These trailblazers appear after the Pineda Causeway intersection with Fringetree Lane and Peninsula Circle, residential streets to the Grand Haven development. Photo taken 09/28/13. Approaching Wickham Road (Brevard County Road 509), Pineda Causeway continues along a controlled access arterial by the Deer Lakes and Windsor Estates neighborhoods. Photo taken 09/28/13. Wickham Road is an arterial route arcing northwest from Pineda Causeway to Interstate 95 at Exit 191 and bee lining south through Melbourne to West Melbourne. Unmarked here, County Road 509 runs 18.53 miles overall between CR 514 in Palm Bay and I-95 at Viera. Photo taken 09/28/13. Although officially CR 404, a confirming marker for SR 404 stands beyond Wickham Road (CR 509) along Pineda Causeway eastbound. Costing just over $5 million, the realignment of Pineda Causeway south from Pineda Plaza Way was completed by July 2009.3 Photo taken 09/28/13. Continuing past the signal with Holy Trinity Drive, Pineda Causeway crosses the Florida East Coast (FEC) Railway and enters a six-ramp parclo interchange with U.S. 1. Work through 2020 here elevates the four-lane expressway across the FEC Railway tracks. Photo taken 09/28/13. U.S. 1 (Old Dixie Highway) straddles the west banks of the Indian River south into the town of Palm Shores and north through unincorporated areas to Plover Point. Photo taken 09/28/13. Pineda Causeway is part of the 233-mile system of the Indian River Lagoon National Scenic Byway established by FDOT on June 13, 2000. The scenic byway along SR 404 connects north-south legs along both U.S. 1 and SR A1A. Photo taken 09/28/13. Florida 404 crosses Indian River Lagoon ahead of a diamond interchange with County Road 3 (South Tropical Trail) on Merritt Island. Photo taken 09/28/13. The SR 404 eastbound span across Indian River Lagoon totals 2,283 feet in length. The 64-foot high bridge was constructed in 1971.4 Photo taken 09/28/13. County Road 3 is an unsigned route following South Tropical Trail along the narrow strip of Merritt Island south to the Mathers Bridge and north to Courteney Parkway at Rockwell. Photo taken 09/28/13. The first in a series of bridges across the Banana River takes Pineda Causeway over the west relief channel. Photo taken 09/28/13. The main channel bridge along SR 404 (Pineda Causeway) over the Banana River crests at 43 feet.5 Photo taken 09/28/13. A half diamond interchange joins SR 404 (Pineda Causeway) with the north end of SR 513 (Patrick Drive) and the South Gate to Patrick Air Force Base in one mile. Photo taken 09/28/13. 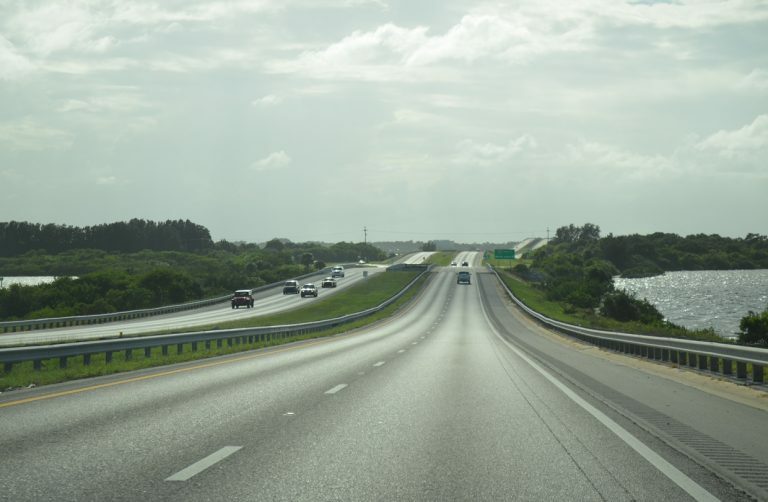 Florida 513 is a two-lane highway leading 5.25 miles south from Pineda Causeway and Patrick AFB through South Patrick Shores, the cities of Satellite Beach and Indian Harbour Beach to Florida 518 (Eau Gallie Causeway) at Melbourne. Photo taken 09/28/13. Pineda Causeway extends east a half mile from Florida 513 to Florida A1A. Photo taken 09/28/13. A resurfacing project finished in July 2018 through South Patrick Shores reconfigured the intersection with SR 404 (Pineda Causeway) to eliminate the northbound bypass lane along SR A1A. A sidewalk was extended in place of the former travel lane. Photo taken 09/28/13. SR A1A runs north along side Patrick AFB to South Cocoa Beach and south through South Patrick Shores into Satellite Beach. The Brevard section of SR A1A stretches northward to Cocoa via Bennett Causeway west and south to Indian River County at Sebastian Inlet. Photo taken 09/28/13. Florida 404 (Pineda Causeway) commences westbound between Patrick Air Force Base and a subdivision at South Patrick Shores. Photo taken 09/28/13. Pineda Causeway spans Patrick Drive (SR 513) and the south entrance to Patrick AFB and continues west across the Banana River to South Tropical Trail (CR 3) on Merritt Island. Photo taken 05/05/18. The second of three bridges across the Banana River takes Pineda Causeway over the main boating channel. Photo taken 05/05/18. The 1,002 foot long span over the Banana River main channel tops out at 43 feet.5 Photo taken 05/05/18. County Road 3 is an unmarked route traveling 16.6 miles north from Banana River Drive and SR 513 (Patrick Drive) at Indian Harbour Beach to SR 520 at Merritt Island. Photo taken 05/05/18. Continuing west across Indian River Lagoon, SR 404 (Pineda Causeway) meets U.S. 1 (Old Dixie Highway) at Palm Shores in one mile. Photo taken 09/28/13. Like the causeway across the Banana River, SR 404 spans three bridges over the Indian River. The main channel bridge measures 2,282 feet in length at a height of 64 feet.6 Photos taken 05/05/18. Pineda Causeway enters the six-ramp parclo interchange with U.S. 1 (Old Dixie Highway) at the northbound on-ramp to Rockledge and Cocoa. Photo taken 05/05/18. A loop ramp follows from SR 404 (Pineda Causeway) west to U.S. 1 (Old Dixie Highway) south through Palm Shores to Melbourne. Photo taken 05/05/18. Construction underway from July 2018 to May 2020 elevates Pineda Causeway over the Florida East Coast (FEC) Railway, located between the exchange with U.S. 1 and signalized intersection with Holy Trinity Drive. Providing a cutoff to Wickham Road (CR 509) north, unsigned CR 404 (Pineda Plaza Way) partitions with Pineda Causeway just ahead. Photo taken 09/28/13. An I-95 trailblazer stands at the intersection with Holy Trinity Lane south. Groundbreaking for Pineda Causeway Extension phase 1, the realignment southwest to Wickham Road, took place nearby on December 14, 2007.7 Photo taken 05/05/18. A westbound off-ramp departs for Pineda Plaza Way (CR 404), the original alignment of Pineda Causeway west to Wickham Road. Photo taken 05/05/18. Pineda Plaza Way (CR 404) connects with Wickham Road (CR 509) across from Windsor Estates Drive, the entrance for the Windsor Estates subdivision. Pineda Causeway intersects CR 509 to the immediate south. Photo taken 05/05/18. Pineda Causeway fully opened west from Wickham Road to Interstate 95 on May 2, 2011.8 Photo taken 03/31/18. Wickham Road (County Road 509) constitutes a four-lane arterial running north to I-95 at Viera and south through Melbourne and West Melbourne. Photo taken 03/31/18. Trailblazers for I-95 appear along the unnumbered section of Pineda Causeway west of Wickham Road. Construction on Pineda Causeway Extension phase 2 kicked off west of Wickham Road on April 7, 2009.3. Photo taken 03/31/18. Pineda Causeway curves southwest across an area of wetlands ahead of the intersection with Fringetree Lane and Pensinula Circle at the Grand Haven development. Photo taken 09/28/13. Pineda Causeway continues west as a controlled access arterial by the St. Andrews Manor subdivision. Photo taken 03/31/18. Estuary Boulevard north and St. Andrews Boulevard south come together at the ensuing traffic light along Pineda Causeway westbound. Photo taken 03/31/18. One last I-95 trailblazer stands along Pineda Causeway westbound beside the Brisbane Isle subdivision. Photo taken 03/31/18. Pineda Causeway ends westbound at a diamond interchange with Interstate 95. Photo taken 03/31/18. The exchange with Interstate 95 and westernmost portion of Pineda Causeway were constructed as part of the $196 million six-lane expansion project along I-95 between Rockledge and Palm Bay.8 Photo taken 03/31/18. "Pineda Causeway bridge work likely to take more than 2 years." Viera Voice (FL), June 27, 2018. "$24 million railroad overpass construction project is underway on Pineda Causeway Extension." Florida Today. July 19, 2018. "Pineda Causeway Extension advances west." Hometown News (Fort Pierce, FL), April 17, 2009. SR-404 EB over Indian River, Brevard County, Florida. BridgeReports.com. SR-404 EB over Banana River, Brevard County, Florida. BridgeReports.com. SR-404 WB over Indian River, Brevard County, Florida. BridgeReports.com. "Groundbreaking set for Pineda Causeway work." Hometown News (Fort Pierce, FL), October 19, 2007. "Road extension is timesaver for commuters." Hometown News (Fort Pierce, FL), May 13, 2011. 09/28/13 by AARoads and JP Nasiatka. 05/05/18 by AARoads and JP Nasiatka.